The Panthers’ shift from the Independent Division to the Freedom Division is just one of a number of changes facing the team in 2018–19. 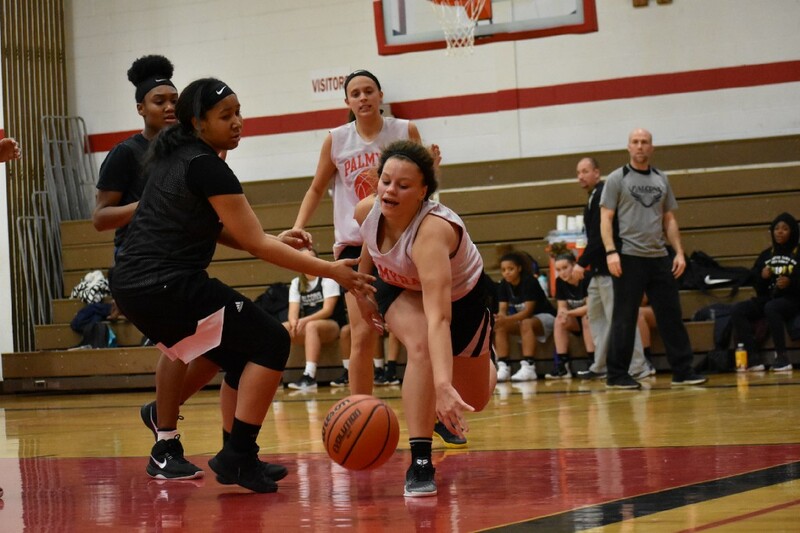 Last year, Palmyra High School girls basketball had one of its strongest seasons in recent memory, winning 21 games, winning a conference title for the first time in a decade and advancing to the semifinals of the South Jersey Group I tournament. This year, the Panthers will try to repeat last year’s accomplishments in a new division and with a number of new faces in the starting lineup. In the offseason, Palmyra lost one of its best offensive players, Melvonna Singleton, and one of its best defensive players, Madison Conroy, to graduation. Head coach Sean Brady is looking for some underclassmen to fill in those spots and said sophomores Olivia Falicki and Elizabeth Shover could earn a lot more minutes this season. Another player who could see a lot of time on varsity is freshman Sophia Wilburn, a player Brady sees as very poised for her age. “She’s a very fundamental player,” Brady said. “She does a lot of things well, so she’s going to help us. While the Panthers have to replace Singleton and her 340 points from last year, they return another dynamic offensive player, junior Ashanti Taylor. Taylor finished right behind Singleton with 330 points last year as a sophomore and has scored more than 600 points in her first two seasons with the team. Palmyra also welcomes back senior Siani Haynes this season. Haynes was an outstanding rebounder for the Panthers during her freshman and sophomore years, but did not play with the team last year as she instead competed in winter track and field. Haynes headlines a tall group of forwards for Palmyra, which tries to beat the opposition in ways other than just height. New players aren’t the only changes Palmyra faces this season. The Panthers have also switched divisions in the Burlington County Scholastic League, shifting from the Independent Division to the Freedom Division. This places Palmyra in the same division as Holy Cross Academy, typically one of the top teams in the county. The Panthers were scheduled to play Holy Cross in their opening game on Dec. 14. Despite all of the changes, Brady isn’t concerned about his team meeting specific expectations. Instead, he is hoping to find the right combination of talent on the court to allow Palmyra to have yet another successful season. “It’s getting them used to each other, getting them in and seeing what parts work with each other,” Brady said about the early part of the season. “Hopefully we peak and get to that point at the right time of the year,” he added.